Gene Ramsbottom was accorded “Distinguished Artist” designation in 2015 by FANS, Funding for the Arts on the North Shore, (representing the tri-Cities of North Vancouver, West Vancouver and District of North Vancouver) in recognition of his lifelong artistic accomplishments nationally and internationally. He joined the CBC Radio Orchestra clarinet section in 1974 and was its principal clarinetist from 1984 until November 16, 2008 when the 70 year-old radio orchestra was disbanded. Maestro Richard Bonynge appointed him as the founding principal clarinetist of the Vancouver Opera Orchestra from 1975-1996. He has performed as a chamber musician and soloist in Canada, England, France, Germany, Israel, China, Hong Kong, Taiwan, the USA and Ireland. A life-long producer, sponsor and organizer of classical music events, some of his many concert presentations include the Whistler International Mozart Festival (1989 & 1990) and the OUT FOR LUNCH Friday noon-hour concert series now in its 32nd season at the Vancouver Art Gallery (the 868th concert was on April 14th and the OfL series was voted #1 Vancouver’s most significant event in PLACES THAT MATTER, a Vancouver Heritage Foundation survey in 2011). Since the early 1980s he has taught clarinet and chamber music for the Schools of Music at the University of British Columbia, Douglas College and Capilano University. With over forty-seven years of teaching experience he is the senior-most clarinet teacher in British Columbia’s history. Over 55 commercial recordings and innumerable radio broadcasts are to his credit and establish him as being one of Canada’s most recorded classical orchestral clarinetists. His principal clarinet teachers have been Carl Kellett (Vancouver), Ronald deKant (Vancouver Symphony), Peter Hadcock, (Boston Symphony), Robert Marcellus (Cleveland Orchestra), Marcel Moyse (Brattleboro, Vermont) and Marc Lifschey (San Fransisco Symphony). Advanced music studies in the U.S.A. were possible with scholarship awards from the Canada Council and the B.C. Cultural Services Fund. He served as an apprentice arts manager under a Canada Council initiative with George Zukerman (Vancouver, B.C.) at Overture Concerts in 1976. In May, 2005 Mr. Ramsbottom performed the Shanghai premiere of Messiaen’s “Quartet for the End of Time” at an International Concert for World Peace commemorating the 60th anniversary of the end of WWII. In December 2006 he was featured as a chamber musician and guest faculty soloist in the UBC Symphonic Wind Ensemble’s tour to Hong Kong and Taiwan. In May 2007 he performed Stephen Chatman’s “Prairie Dawn” Clarinet Concerto in Taipei with their National University of the Arts Orchestra and was a guest professor. 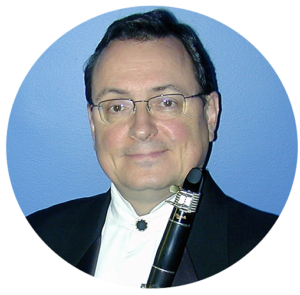 He was the featured Canadian artist at the Wright State University’s Clarinet Symposium in Dayton, Ohio in January, 2009 and was a featured artist at Alabama’s Troy State University’s Clarinet conference in 2010. He commissioned and premiered Alain Mayrand’s “Battling Boggarts” with American clarinetist Dr. Tim Phillips and the Troy University Symphonic Winds at the 2011 Whistler Con Brio Music Festival. He toured as the guest soloist with the West Vancouver Youth Band in their Germany tour in 2007 and their July 2011 tour of France, Belgium and Holland. He has been the principal clarinetist and soloist with SUMMER MUSIC IN GALWAY/SUMMER MUSIC ON THE SHANNON Festival since 2009 in Ireland and is currently the principal clarinetist with Vancouver’s West Coast Symphony Orchestra and is guest conductor of the Terrace Symphony.